I’d always thought that authentic gazpacho required blending that Mediterranean staple, stale bread, but not according to José Andrés. His incredibly simple, purist gazpacho calls for just tomatoes, cucumber, green pepper, a garlic clove, sherry vinegar, olive oil and salt. I added half a fresh jalapeno, helped out our still somewhat pallid NYC tomatoes with some San Marzano juice, and omitted his elaborate garnish, substituting a slice of avocado. I like some chunkiness & pulp, so didn’t bother to strain. His tips for tasting at key steps are essential. 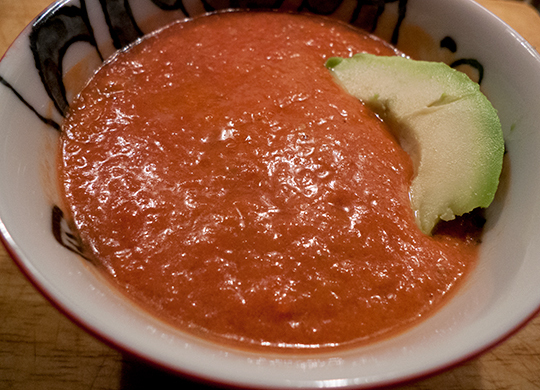 This gazpacho looks positively delicious. For the garnish, though, I would substitute some cilantro, given that the avocado’s mild taste wouldn’t add much to the dish. I’m not a cook or anything. Just sayin’. Good night.